Fleetwood RV, Inc., a leading producer of Class A and Class C recreational vehicles, today launched the 2011 Storm – a "crossover" motor home that features the sleeping capacity and value of a Class C motor home along with the roominess and storage capacity of a Class A motor home. "The 2011 Storm is a special motor home because it includes the best aspects of both a Class A and a Class C motor home," said John Draheim, CEO of Fleetwood RV, Inc. "Storm is loaded with standard features and provides a great value at price that appeals to a wide range of RVers." 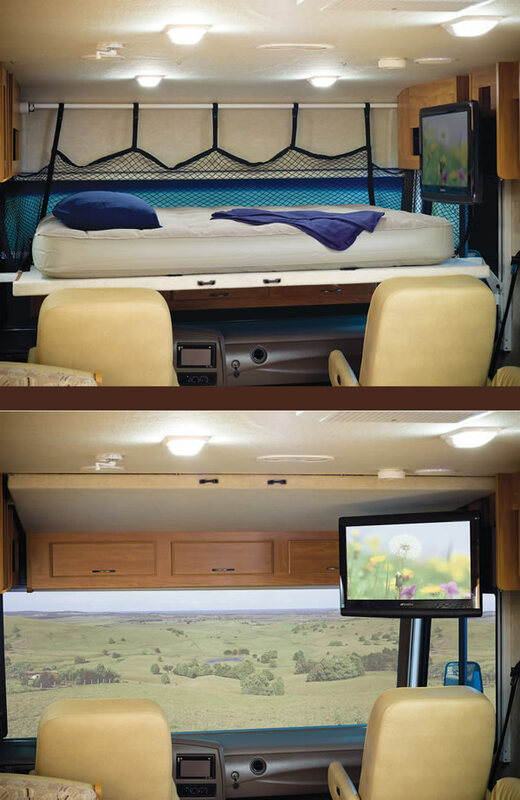 The 2011 Storm is available in three floor plans: a 28-foot single-slide, rear bedroom floor plan with walk-around queen bed and oversized wrap-around booth dinette (28MS); a 31-foot dual-slide, side-aisle floor plan with opposing dinette/sofa in the living room (30SA); and a 31-foot dual-slide floor plan with standard traditional bunk beds or the optional "Bunk Bed-n-Breakfast" space-saving two-person dinette with convertible bunk beds (32BH). The innovative "Hide-a-Loft" feature, a queen-sized, electronic drop-down bed with air mattress located above the driver/passenger captain's chairs, is also an available option on all floor plans. Standard features on the 2011 Storm include one-piece windshield, 82" interior height; Soft Touch Flexsteel® driver/passenger captain's chairs; Soft Touch Flair® sofa; convertible Dream Dinette with two cup holders; 26" LCD wide-screen TV with DVD player; pleated night shades; full extension drawer guides and transit-ship locks; high-gloss fiberglass sidewalls; full basement exterior with enclosed, heated holding tanks and luggage compartments; pass-through storage; Onan® 4.0kw MicroQuiet generator;15,000 BTU ducted air conditioner; patio awning; rear vision camera with monitor; power heated remote mirrors; power entry step; stainless steel wheel simulators; black tank sani-flush; exterior shower; Fantastic power roof vent; dual deep cycle auxiliary batteries; one-inch (inside diameter) water tank drain; and whole coach water filtration. Base MSRP on the 2011 Storm starts at $82,000. 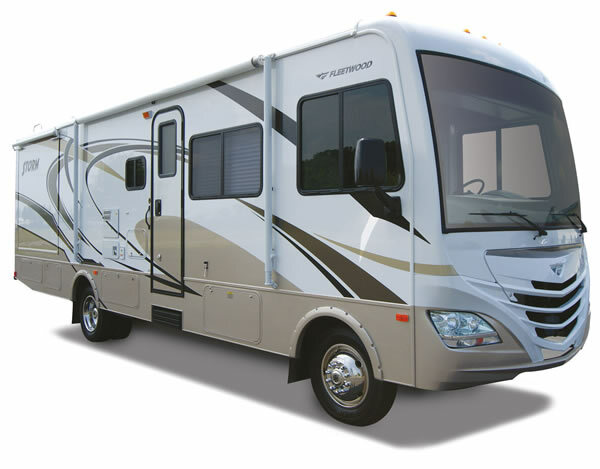 For more information about Fleetwood RV and its full-line of Class A and Class C recreational vehicles, call 1-800-322-8216 or visit www.fleetwoodrv.com.